Contact Senate Committee on Seniors, Families and Children to oppose SB4 before January 30, 2019. SB4 introduces work requirements for Supplemental Nutrition Assistance Program (SNAP) recipients and bans waivers regardless of economic conditions in the state, thus making it harder to exempt vulnerable individuals. 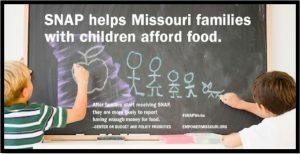 “This bill could cause tens of thousands of Missouri’s parents and children to lose access to benefits from SNAP, increasing hunger in our state.” says Jeanette Mott Oxford, Executive Director with Empower Missouri. SNAP is our nations’ most important anti-hunger program. It helps struggling families with children, seniors, and people with disabilities put healthy food on their tables. 1 out of 6 Missourians in rural Missouri and 1 out of 8 urban Missourians presently rely on SNAP for a portion of their daily food needs. SNAP’s positive impacts are lasting. Making SNAP work requirements harsher will not improve outcomes for low income people. The latest research shows that even ‘marginal’ food insecurity is associated with poor health and developmental outcomes. Advocates across the state are joining together to oppose SB4 because it penalizes the whole family if the head of household is unable to find work and is very detrimental to the health and well-being of children. A hearing for SB4 is scheduled for January 30, 2019 before the Senate Committee on Seniors, Families and Children in Jefferson City, MO. We urge advocates to contact members of the Senate Committee on Seniors, Families and Children to make your voice heard in opposition of SB4.